I don’t know if I am starting to make stuff that is completely out in left field, but the other day I was in one of my favorite restaurants in the area, and they had a dish that I could not stop eating: Lamb Biryani. Of course it was served over rice, and with a side of naan…but the meat mixture stood on its own. I was just picking the meat out of the dish left and right! As usual, I had to run home and try to whip this up myself. In lieu of rice, I tossed in diced sweet potatoes for a filler–I didn’t miss the rice whatsoever! This was a delicious entrée that everyone in the family enjoyed and it wasn’t as complicated as I thought! Mix up the meat and marinade mixture, marinate in refrigerator for 2 to 24 hours. In a dutch oven, saute the oil and onions over med-high heat until translucent. Add diced sweet potatoes and stir fry until “al dente” but not mushy. Stir in tomatoes and set aside in large bowl. Cover to keep warm. In the now-empty dutch oven, stir fry the marinated meat until it is done but not over-done!! Add the onions, sweet potatoes, and tomatoes, and a fistful of chopped cilantro back into the pot, combine. Serve, topped with lots of extra cilantro! **It came to my attention (in the comments below) that “biryani” is inherently a rice dish, and cannot be served as a curry and still go by the name “biryani”. There are often substitutions made in paleo cuisine: paleo “noodles” “rice” “pizza crust” and the like. I did not add basmati rice to this dish to maintain grain-free compliance…and I was tired of subbing cauliflower. So, this is a curry style dish that was inspired by a delicious lamb biryani I enjoyed. I wonder if it would seem more authentic to the real texture and aesthetic if you grated then sauteed the sweet potato instead of frying it cubed. As the guinea pig for this dish, I must say I was truly impressed. I am always happy to try new food and Leigh never disappoints! If you don’t mind my saying, I would like to add something here……Biryani means a rice dish that has been fried and then combined with a rich gravy ( any kind of meat, or vegetable) dish and slow cooked covered………making biryani without rice would be like making Lo Mein without noodles or Pizza without cheese or pasta without, well pasta. So you can have lamb biryani, beef biryani, chicken biryani, fish biryani, vegetable biryani……..but it’s rice that makes the biryani.Now a days most people half cook the rice instead of frying it, and then cooking it ‘dum’ style. What you ate was lamb biryani, and what you made was a lamb curry, and it looks delicious 🙂 I like the combination of potatoes in the end. 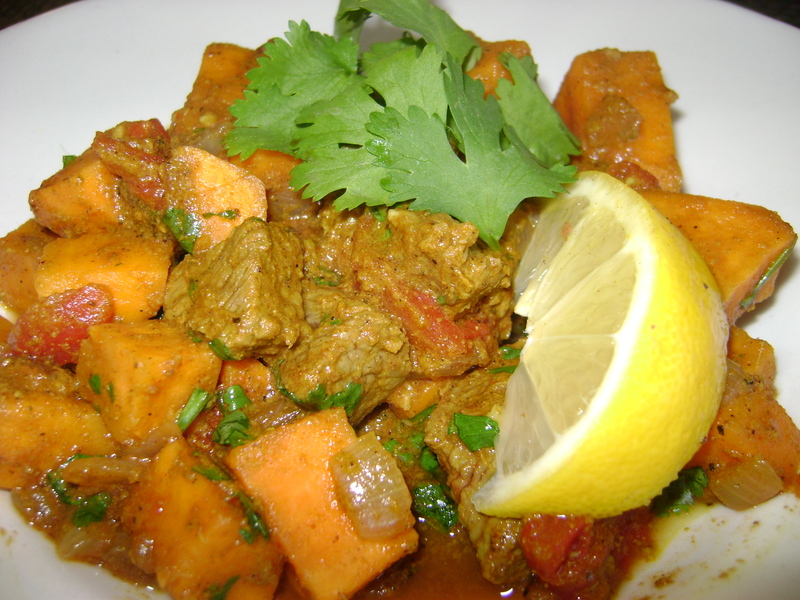 Potatoes in lamb meat curry are very popular in both India and Pakistan, and much sought after. Wonderful! I really appreciate that information, HA! I guess a quick click on the google would have saved me from this mistake…thanks for the feedback…now to come up with a new title! Maybe ‘Lamb Curry Inspired from biryani’ or something like that? Hmm… I think that title sounds off somehow– honest opinion. I like the new recipe title. I find so many delicious recipes here and share them with everyone– on facebook, emails, etc! Thank you! We appreciate your feedback so much! I think that it would be smart to make just the meat mixture. The sweet potatoes were yummy with it..but I think I will make this again sans potato.